Athenaeum: "A school in ancient Rome for the study of the arts, named in honour of Athena, the Greek Goddess of the arts and wisdom. An association of persons meeting for the purpose of mutual improvement." Light shimmers in many colours. To understand how you absorb and transmit light is to know your most intimate self. The Colour Rays invite you to absorb and transmit the energy of light as deeply as possible – for your own well-being and for the benefit of the planet. Each colour touches an aspect of our psychological, emotional and spiritual experiencing. This robust online 8-week course with weekly conference calls and assignments introduces you to 21 of the 147 Colour Ray Masters that have been transmitting love, light, laughter and profound healing within the Laughing Rainbow Mystery School since 1987. You receive your personal Colour Chart which is a reading from the Colour Masters showing where you are flowing with the Rays and where you are blocked. This is a soul reading, which gives you an opportunity to celebrate your gifts and work with your shadow. 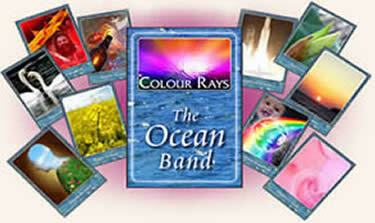 For the Mauve Band and Ocean Band, you receive a set of 21 cards and a book explaining the Colours and your Chart. For the Atlantis Band, Earth Band and Flower Band, you receive a booklet describing the Rays. This introdution creates a firm foundation for your own journeys and meetings with the Masters. 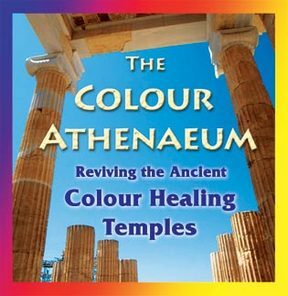 In the Colour Athenaeum you are part of a supportive community. We connect online in a closed group, sharing the work of the week and have the option of journeying on behalf of each other. You practice giving and receiving help with the Colour Rays. When you are adept on a Ray you will have the opportunity to attune and support someone in the circle who has a ‘Rock’ on that Ray. When you are 'rocked' on a Ray someone else in the circle who is an adept may work with yours. Hence the title of Athenaeum. Each week, there is a tutorial focusing on the Colours. These tutorials are held as live sessions via conference call. They include shamanic journeys, visualizations, and transfiguration exercises as well as an opportunity for question and answer sessions. ALL CALLS ARE RECORDED AND UPLOADED ON THE SAME DAY OF THE CALL. Each week there is written document with questions for reflection and recipes to assist you to take the colours of the week deeper with journeying, journaling and craftwork to build your relationship with each Ray. The questions come out after our weekly call with prompts to remind you to write notes about the direct journey guidance you received in the call. We often journey on behalf of each other in the group. This is the time to make the notes and send them to your colleagues in the circle. Then there are questions to open an inner dialogue for personal enquiry and self-reflection in relation to the soul lessons of the Rays of the week. This is where you do your personal work. These questions you can keep for yourself, share with me, or share in the closed private email group if you wish. Finally there is a section of "recipes" or suggestions for further journeying, craft work or integration explorations. There is no way anyone could do all of the suggested exercises; these are given for you to work with over years. You pick and choose according to what suits you. If you are working towards being a Colour Ray Practitoner, any of this work counts towards evidence. Each Friday you receive the Rainbow Revelation, with insights into the Colour Rays of the week, leading you into deeper explorations of the Rays. 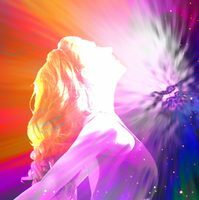 We focus primarily on one or two colours a week so you can become more intimate with the multi-layered essence of the Rays.The Rainbow Revelations also include Stations and Sectors, all part of the planetary healing dance. You discover and meet the Master of your Major Ray, one of your main allies, who is here to love and guide you on your path. Your Major Ray reveals a significant soul lesson and purpose at this time in your life. As you grow your lessons and ‘purposes’ evolve. I treasure this opportunity to work with the infinite joy and ecstasy of the Colours with you. An 8-week on-line course and home-study webinar. All Conference Calls are Tuesdays at 19:00 UK time. All Conference Calls are Tuesdays at 19:00 UK time. 2nd week Call will be 14th March which is a Wednesday. Listen to an excerpt from a Conference Call describing how the Storm Black Ray is here to help us move joyfully through challenging times. The Colour Rays are powerful teachers. Working with them has accelerated my path of self-development/evolution. Working with the Charts and being able to journey for myself to meet the Colours directly was like coming home. They each have such unique gifts to share, shining a light on my gifts as well as my blocks. For me to actually see my gifts was the biggest healing. It’s easy to get stuck on looking at what’s not flowing, but to be able to see what is flowing through us beautifully is a treasure in getting to know oneself better. It was really great fun doing the Athenaeum and working in community with others to journey for each other and share our insights. I cannot recommend working with the Colour Rays enough. If you are unsure….I say JUMP IN….not only is it a tool for self, but also for working with my clients….as a practitioner, they are invaluable teachers informing my practice. A.R. Thinking about being Light, wishing we were Light, and desiring to transform are very important elements of becoming Light; but they are not enough to create the transformation on their own. What is needed is a keen sense of witnessing and ownership of what is happening inside. Life is our teacher and life brings us challenges but it is often a slow, gradual process. It doesn’t become a path of awakening unless you make it so. Transforming your own density, transforming your own consciousness and moving what is in the unconscious, the shadow ,into the light, is actually WORK. It is work that can be demanding and challenging. Moving with the Colour Rays in the Colour Athenaeum makes it a liberating and more joyful process. It gives you a focus, a lens to do the work in an accelerated, inspiring and sustaining way. And it's fun! The Masters, tickle, provoke and cajole us out of our stuckness, our fears and our limitations. They dance us into the beyond without our even realizing it. "We are the seeds and the sensors of Revelation; that is our task and yet to be equipped for this task we need to be conscious. We need to be conscious of exactly how the ego works; exactly how the mind has its field day if you give it space. When the mind is tamed – at last – we can leave the shadowy caves of fear and we have the potency and the capacity to swim freely across the swollen, turbulent Ocean. We can spread our wings over the whole of Creation – but only when the mind is tamed."